at Orange Technical College Mid Florida Campus! 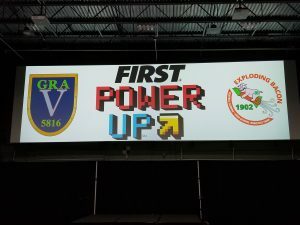 Our kickoff will feature workshops to help you focus on being competition ready with general FIRST Robotics Competition topics as well as virtual field elements after the game is revealed. 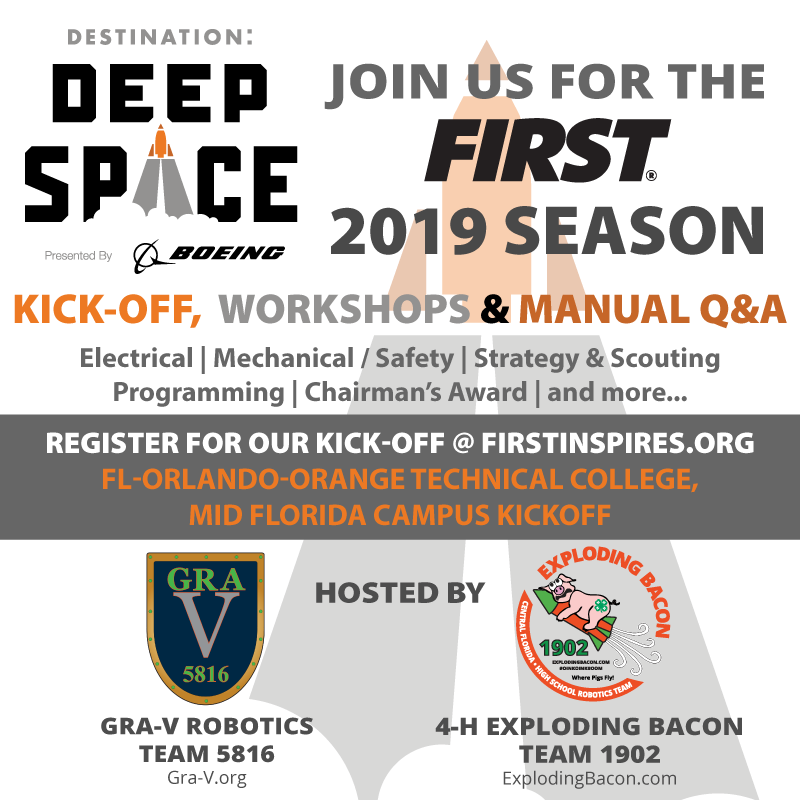 The game reveal stream will be viewed in Mid Florida Tech’s Motion capture auditorium and our workshops will be done in their high-tech classrooms. After lunch we will host Game Manual Q&A discussions. FIRST will NOT be releasing the field elements for construction and reveal for kickoff this year, but we plan to construct the elements with cardboard on an outlined actual size field to give students and mentors in attendance an idea of the scale and location of each element to get a perspective on the the field and game for Destination: Deep Space. Before the kickoff video join us for workshops. 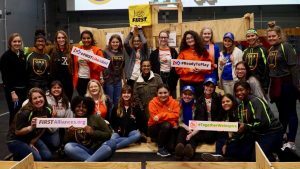 Get ready not just for build season, but attend our workshops for tips to be competition ready after the 6 six week build season. 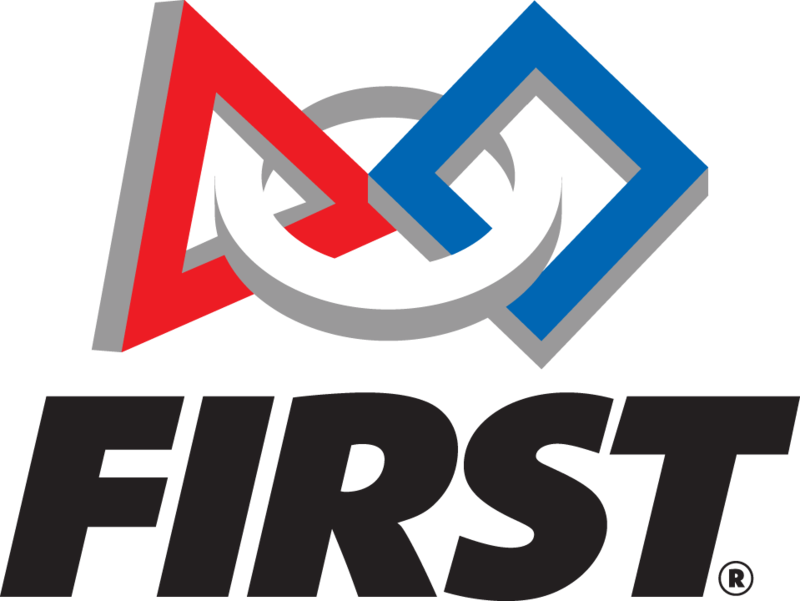 Numerous general FIRST Robotics Competition topics covering everything from team organization to programming – with a focus on competing in the 2019 season. During lunch a group of Game Manual enthusiasts will be scouring the 2019 Game Manual for changes and scoring points of interest and then present for group discussion. We are not providing a lunch to order, but you can arrange with your team to get lunch from one of the numerous places in the area. Here are a few listed for your convenience. Numerous traditional burger and sub fast foods in the area. 8:30 AM: Venue opens to teams. 9:00 AM: Pre-game Workshops each will focus on tips to help you be competition ready! 11:30 PM (when kickoff video ends): Kit distribution & Virtual field construction will begin.